Following the Keira Kilbane Foundation 5K we provided individual pretzel bags, granola bars, and bananas to the inpatient pediatric cancer unit. The Keira Kilbane Foundation hosted some very special VIP’s to close out 2014. 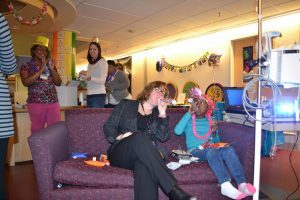 Evening events included watching LEGO Movie, dinner and sparkling grape juice, playing carnival games, a photo booth, Legos for each patient, and additional arts/crafts. The event concluded with a New Year’s Eve count down, a little before midnight. The first formal assistance from the Keira Kilbane Foundation was provided on Thanksgiving Day in 2014. 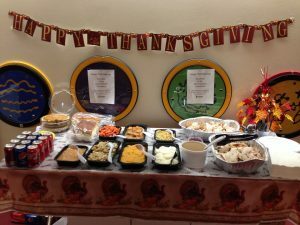 We provided a traditional Thanksgiving Dinner to the patients, families, and staff at Rainbow 2 to help brighten their holiday.